Over the past seven years, Three Blue Ducks has grown into one of Australia’s most beloved hospitality groups. Following on from its first location in Bronte and its subsequent venues in Byron Bay and Rosebery, the crew consisting of Mark Labrooy, Sam Reid-Boquist, Chris Sorrell, Darren Robertson, Jeff Bennett and Andy Allen were approached by W Brisbane to implement a new Three Blue Ducks concept as the hotel’s signature restaurant. 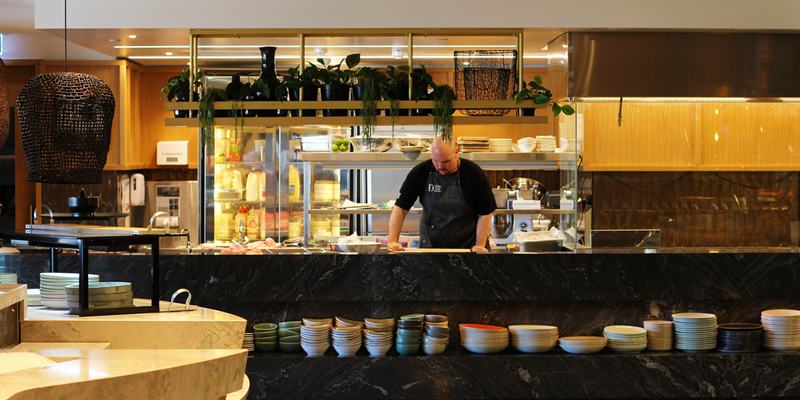 On Friday June 1, Three Blue Ducks unveiled its Brisbane location, the group’s largest and most sophisticated set up to date. Much like its southern siblings, Three Blue Ducks Brisbane is plating up the brand’s own honest and ethically sourced fare, highlighting the benefits of conscious consumption and serving it in a comfortable-yet-modern setting with what could be the best view in town. 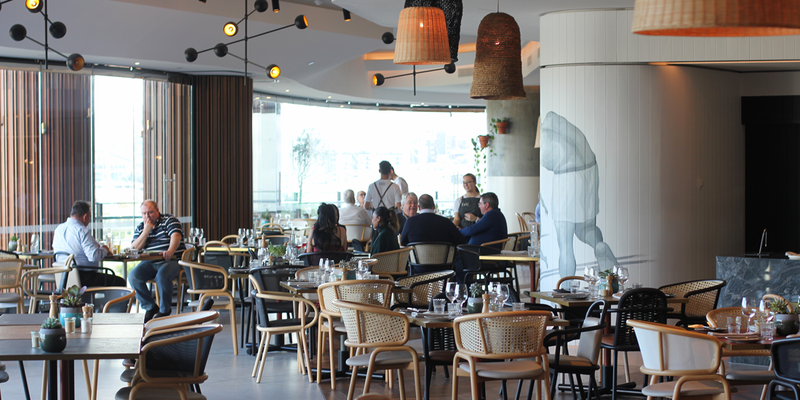 Situated on level three of W Brisbane, Three Blue Ducks instantly scores top marks for location. The spacious 156-seater venue looks out over the Brisbane River through floor-to-ceiling windows, boasting unimpeded views of South Bank and beyond from nearly every seat in the house – indoor or outdoor. From the outset, Three Blue Ducks offers a sense of flow and space, with a sunlit and airy design complemented by homely touches that act as a comfortable counterbalance to W Brisbane’s cutting-edge aesthetic. A bucolic palette of woods, concrete, understated murals and greenery gives the space a calming and convivial vibe, one that is both intimate and comfortable. The kitchen boasts three stations that service different elements of the menu, with a sizeable coal pit, grill and wood-fired oven supplemented by a dedicated coffee counter and an impressive bar. 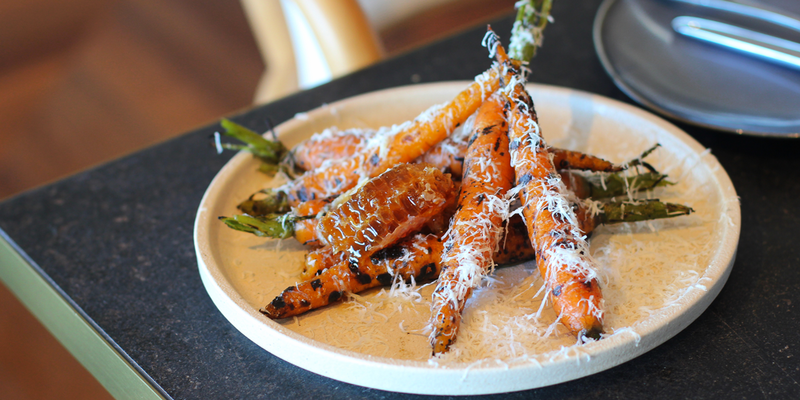 Across all of its locations, the Three Blue Ducks team anchors its bold menu with a produce-driven focus, sourcing top-quality goods from local suppliers. Queensland seafood comprises a good portion of the menu, with meat supplied by Three Blue Ducks’ ethical suppliers from down south. The crew has brought a huge portion of its signature dishes to Brisbane, but several new items have been created to make use of the kitchen’s vast array of equipment. A small breakfast buffet offering is available in the mornings, backed by a la carte dishes such as wood-roasted mushrooms and a flaked house-smoked salmon kedgeree bowl with cucumber and toasted almonds. As the day progresses, Three Blue Ducks begins a lunch service offering breads fresh from the oven, small plates and hearty mains. Chargrilled king prawns, maple-glazed roast pumpkin, grilled fish, crab with yuzu mayo and a signature cheeseburger are just some of the scrumptious selections on hand. The dinner service kicks off at sunset, showcasing butter-coated Moreton Bay bugs, succulent lamb shoulder, porchetta with roast apples, corn with lime and miso butter, and a host of decadent desserts. Cocktails, tap and bottled cider and beer (including a specialty brew made in conjunction with Green Beacon Brewing), and a sizeable selection of sustainable, natural, biodynamic and organic wines by the glass, carafe or bottle are available at the bar, plus coffee by Single O. One of the founding mantras of Three Blue Ducks is its ethical and sustainable approach, which has been employed across all aspects of its Brisbane location. Beer, wine, kombucha and water are served off tap to minimise bottle waste, and the restaurant is using biodegradable cups for takeaway coffee (as well as selling Three Blue Ducks KeepCups). Food waste is minimised where possible, and the crew has teamed up with OzHarvest to recycle any edible leftovers. For opening hours, contact details and booking information, find Three Blue Ducks in the Stumble Guide.